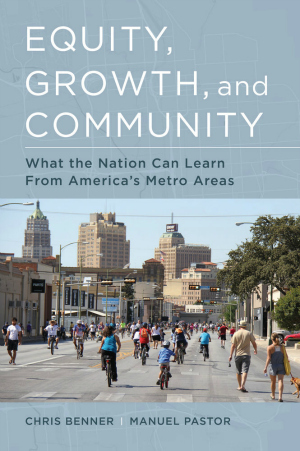 Communities that know together, grow together is the premise of UC Santa Cruz professor Chris Benner’s new book, Equity, Growth, and Community: What the Nation Can Learn From America’s Metro Areas (University of California Press, 2014). 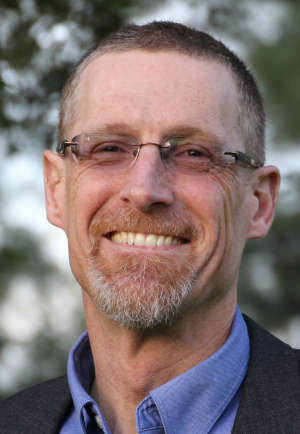 Benner, a professor of environmental studies and sociology, co-wrote the book with Manuel Pastor, a UCSC alumnus and former UCSC professor now with the University of Southern California. Equity, Growth, and Community looks at almost 200 U.S. metropolitan regions to better understand what makes a city economically sustainable. The authors argue that long-term economic growth during the 1990s and 2000s is tied to “epistemic,” or knowledge communities. “Our research suggests that such communities – ones that are diverse in their membership and sources of knowledge, and dynamic in their ability to withstand shocks, continuously learn, and adjust over time – can actually help construct and sustain regional social norms that facilitate the achievements of growth, resilience, and inclusion,” Benner and Pastor write. In other words, ideas matter. The more diverse ideas a community can develop and share, the more it can cooperate and collaborate. The more a region can work together, the more equal it will be. And, the authors suggest, the more equal an area is, the more an economy will expand. Benner and Pastor’s book is one of the first titles to be offered online for download free of charge by a new UC Press open-access publishing platform called Luminos that disseminates social science and ​humanities research in a digital format. Funding for Luminos titles is shared among multiple entities including libraries, said Ivy Anderson, interim executive director of UC's California Digital Library. “The Luminos funding model is a wonderful example of the kind of innovation that is needed to identify sustainable models for academic publishing in the future,” she said. In their research, Benner and Pastor visited 11 regions across the U.S. to better understand how a community responded to specific issues choking growth. A jobs crisis, political fragmentation, education and income disparities, or all of the above – present new problems to communities. How quickly cities respond to these challenges is related to how equal and epistemic its community is. For example, they found that Salt Lake City and Sacramento are examples of effective city and community planning. Grand Rapids, Mich., Charlotte, N.C. and Oklahoma City show how business can drive regional stewardship. In Greensboro, N.C., Fresno, and San Antonio, the authors discovered that partnership is possible even in conditions of conflict. Silicon Valley, Raleigh-Durham, and Seattle offered novel ways to collaborate in a new information-based economy. As inequality in the U.S. continues to dramatically expand, Benner and Pastor’s analysis is a timely response to show how regions can successfully come together to make for a better community and country. Benner joined UC Santa Cruz last year from UC Davis and holds the Dorothy E. Everett Chair in Global Information and Social Entrepreneurship. He is the director of the Everett Program, dedicated to building social innovation through technology. Benner and Pastor previously collaborated on Just Growth: Inclusion and Prosperity in America’s Metropolitan Region (Routledge, 2012). The authors have made their data available on an interactive website, http://growingtogethermetro.org. Readers can explore a specific region or city in depth to see how epistemically diverse the community is.